Five and half years into ministry here and we’re so thankful the various ministries are continuing to grow up– new opportunities, project expansions, growing in skills and knowledge, and adding a few more wrinkles to our faces along the way! We recently received a grant for a portable Ultrasound machine that we’ll soon begin using at the Sarobidy Maternity Center. This amazing piece of advanced equipment will allow the midwives to grow in our skills to asses placental and fetal position, growth, twins and so much more in order to provide the best maternity care for our ladies! 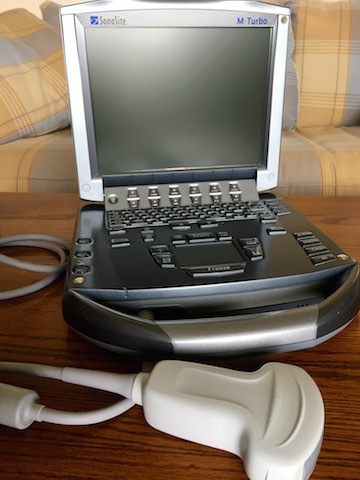 Similar to the ambulance, the grant didn’t cover the entirety of the purchase price of the ultrasound machine, however the sales of our artisan items from Sarobidy Creations made up the financial difference! We praise the Lord for this amazing provision! Please pray with us for Rachel, the Canadian physician who soon will be training us to use the ultrasound! Home Depot, Lowe’s or other large supply store, the work looks a bit different… cutting all the tiles by hand, purchasing and then drying the wood followed by designing and hand-crafting the kitchen cabinets, mixing paint colors in our garage and trying to make them an exact match… like I said, just a bit different! While challenging on multiple levels, it’s also amazing to see three years worth of envisioning come to fruition before our eyes! before cement floors, now non-slip tile throughout the house! The old cement wrap around porch now has tile! The NEW kitchen awaiting upper and lower cabinets! We’re getting ready to start the work OUTSIDE the house… building an incinerator, a waiting house for families of the laboring mama, extending the garage to fit the ambulance properly, an outdoor washing station and building a chicken coop so that we can provide a daily source of protein for the ladies as too many go without! We praise God for all of you who faithfully and generously gave so that we could make these much-needed renovations to the Sarobidy Maternity Center! The house is fresh, clean, welcoming and beautiful– a far cry from it’s former self! Up to this point, we’ve been doing all of these renovations in total faith– from the earliest ones beginning in 2012, to painting the entire house inside and out in 2013, to the massive wall around the entire property and increased security measures in the house in 2014 after a break-in, to the laboratory and outdoor bathrooms in 2015 as well as renovating the guard house into a midwife house (thanks to our teammates, Neal and Danielle who led the charge on this! ), to the current and future renovations this year. I say that we’ve done them in faith because in fact, we don’t own the maternity center property but have been walking forward trusting that the Lord was going to open the door for the purchase of the property. As we recently shared, the owners have agreed to sell and we’ve settled on a price of 100,000 Euros (roughly $111,000)– for the 5-acre piece of property! This property is the HUB of the entire ministry and includes the maternity center, our classroom which doubles as our artisan creations room, the office for both the maternity center and Eden Projects, two smaller houses, a large gazebo where we have our once a month church services and where our teammates (Carlstrom’s, Rota and Andry) hold a weekly Saturday morning Kids Club AND Eden Reforestation Project’s research nursery, seed bank and gallery forest. Of course, $111,000 is no small chunk of change and therefore, we’ve begun searching for grant opportunities and will soon start applications! At the same time, we ask that you would consider donating to the purchase of the property to support the growing up of all these ministries–the Sarobidy Maternity Center, Sarobidy Creations, Kids Club, Eden Projects and the Church. Be on the look out in the next week or two for a special email invitation with a breakdown of just how Red Island Restoration will say THANK YOU for the various donation levels!! In the meantime, if you’d like to give NOW, you can do so by clicking this link that will take you to the dedicated Sarobidy Maternity Center page through our mission organization, WorldVenture. As always, all donations are 100% tax deductible! TO SEE MORE PICTURES OF DAILY LIFE AND MINISTRY AT THE SAROBIDY CENTER, CLICK HERE AND SEE THE SIDE BAR OF OUR NEWSLETTER!!! Steve, both the founder and president of Eden Projectsas well as a good friend of ours, was in Madagascar this month. During that time Steve, Josy, Neal, Jamie and a few others scouted some new Eden mangrove and dry deciduous expansion sites, meeting with the various village elders and surrounding communities. Of course field work always offer amazing opportunities to catch some of the incredible beauty of this red island! Please pray with us for wisdom and trusting relationships with community leaders in these potential expansion sites! Pray with us as well that the reforestation efforts would in time, provide the platform to share the deep love and eternal hope of Christ with these communities! One of the exciting ministries that the Lord has grown in leaps and bounds is the remote fishing village of Mahabana! Jamie and Josy first began visiting Mahabana in 1999 when it was still taboo Jesus and the Bible. In the years since, a strong church has been established, has grown and several have been baptized! The Lord has penetrated powerfully into Mahabana— so much so that those still steeped in traditional animistic worship have been unable to “channel with their ancestors” and therefore have moved their hub away from Mahabana! Even more so, the village of Mahabana is no longer considered taboo Jesus and the Bible! This in large part is because how the Lord has used Josy’s life through his illness and ultimate kidney failure which led to a kidney transplant in India! In addition, God has used the work of Eden Projects in Mahabana and the subsequent planting of over 125 million trees in the last 9 years to further meet people where they are… both in their needs today and the Hope of eternal life. On Saturday, our family, Josy’s family, our teammates, the Carlstrom family and ministry partners, Dina and Maman’i Aby and Selah, our kids’ teacher, will travel by helicopter to the remote villages of Mahabana and Kalamboro to visit and encourage the churches there! Just last September, Kalamboro had it’s first ever church service! Click here to read more about that! Please cover us and the Christians in these villages in prayer as we often experience deep spiritual battles in the days leading up to and during these trips! We look forward to continuing to partner with you in all the ways that the Lord will continue to grow and expand His work and His Kingdom here on the Red Island of Madagascar!